The Mercedes-Benz is a luxury vehicle brand that provides exquisite interior, a comfortable ride, and advanced safety features. The vehicles that are designed by Mercedes-Benz are stylish and have excellent performance. Here’s what makes the new 2018 Mercedes-Benz E 300 worth the buy. Is the Mercedes-Benz E-Class a Good Vehicle? The Mercedes-Benz E-Class is a great vehicle and is equipped with superb turbocharged engines, a smooth ride, and balanced handling. It also has some of the most attractive interiors in this class. The E-Class came up as a finalist for the 2018 Best Luxury Midsize Car for Families award. The Mercedes-Benz E 300 has a 241-horsepower turbocharged 2.0 liter and a four-cylinder engine. You can expect to have an avalanche of power when driving on the highway or simply driving around town. This model enables you to choose between five driving modes that give you more comfort and performance. The steering on the E-Class is sharp and turns corners with ease. You can schedule a test drive at a Mercedes-Benz dealer in San Antonio, TX. There is a vast amount of interior features with the Mercedes-Benz for sale in San Antonio, TX. The standard features include push-button start, remote start, automatic climate control, and crosswind assist. With the COMAND® infotainment system, you will enjoy features such as voice controls, Bluetooth®, Wi-fi hotspot, Apple CarPlay, and more. In the Mercedes-Benz E-Class, you will have tri-zone automatic climate control, a panoramic sunroof, cabin fragrance system, wireless device charging, and a cabin air purification system. 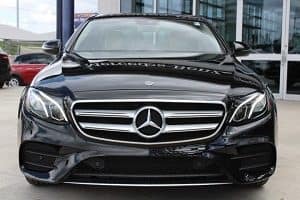 When you buy Mercedes-Benz in San Antonio, TX, you will be amazed that this vehicle provides some of the most leading safety features in the car industry. The Pre-Safe Impulse side feature quickly inflates the passenger seat’s side bolster which moves the passenger 2.75 inches away from the point of impact once the system identifies a side collision. This feature does the same process with the front driver seat. Once the Pre-Safe Sound identifies a crash, the system will expend a short interference signal which triggers a protective reflex in the ear that aids in reducing hearing loss. With the Evasive Steering Assist, you will be assisted if you have to make an evasive maneuver by adding calculated steering torque. With the Cross-Traffic feature of the brake assist system, it will identify cross traffic and automatically brake if necessary. 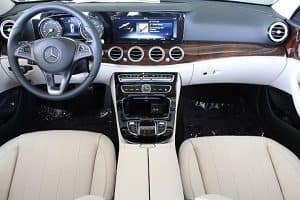 This year, Mercedes-Benz has built the E 300 sedan with a fuel economy of 23 mpg in the city and 30 mpg on the highway along with 273 lb-ft of torque. When you buy Mercedes-Benz car in San Antonio, TX, it comes with a 9-speed automatic transmission that accelerates from 0 to 60 mph in just 6.2 seconds. There are two 12.3 inch in-dash screens which display audio, navigation, and phone information. There are control features that are within easy reach such as the fan speed and temperature. Great safety options are the semi-autonomous driving features including Pre-Safe Impulse side rapidly inflating front seat bolster which decreases the impact from side collisions. Another safety option is the Pre-Safe Sound that decreases noise damage to the passenger’s ears during a collision. Also, there is a blind spot alert that applies the brakes when necessary. A Mercedes-Benz dealership in San Antonio, TX, can help you purchase your next vehicle. 0 comment(s) so far on What Makes the 2018 Mercedes-Benz E 300 Worth the Buy?